Hi everyone! 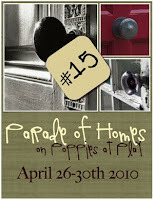 Thanks for stopping by for the Parade of Homes blog hop! House of Smith's is a fun new blog my husband, Cason and I started in order to track the cosmetic part of our families progress on our home remodel and design style, shift! As a full time stay at home Mom of three beautiful girls and running a small business from home, I have found a new appreciation for the beauty and upkeep of my house! And as each day goes by, and a new project gets done the phrase "Love the Space You're In" becomes more and more meaningful to me! 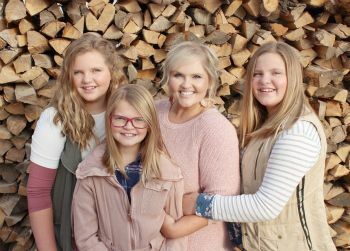 The House of Smiths blog is my way to share, inspire, and learn from our new attempts at tackling projects on our very long list of "things to do!" 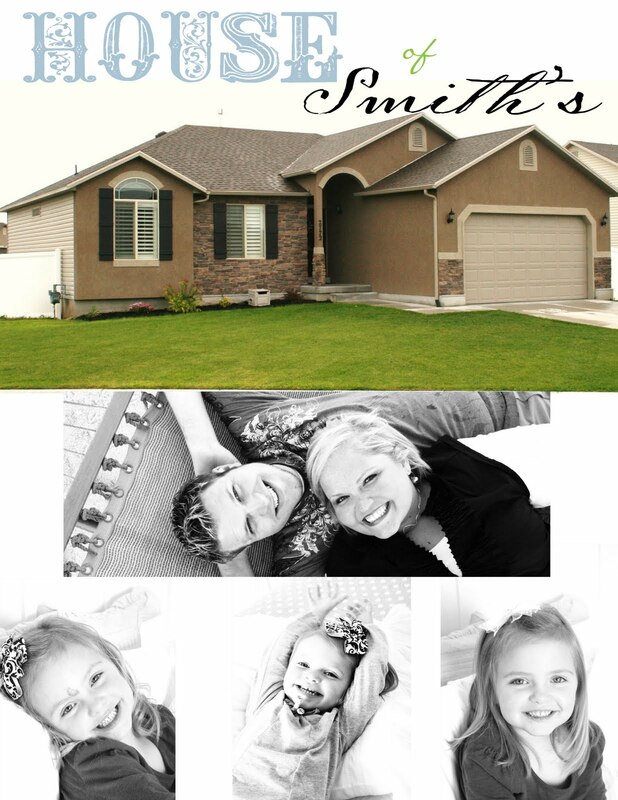 At the Smith house, our motto is... "Making a house, our HOME... one space at a time!" My third daughter, Aubrielle's, bedroom! TV segment on "Freshing up your Laundry Room"
This room still has a LONG way to go, but the progress, so far as been LOTS of fun! I love the direction it's going. Cason would KILL me if I didn't tell everyone to STOP... and LOOK UP! 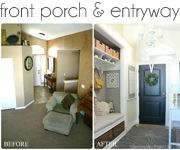 This ceiling transformation was MY FAVORITE! Cason did ALL the work on this one! with a little help from his brother and his soon to be wife! I love to watch our "visions" come to life! This bathroom has been BEYOND fun to transform! I'm still working on decorating inside that little cabinet...is anything really... ever "done"??? ha! Whew! This was a REAL motivator to get some stuff DONE and a BIG thanks to Joe for hosting such a fun event!!! But don't forget to head on over to the next house on the tour! Click on the number below to head to Fab to Drab to see another lovely home! If you've missed out on any of the other great Parade of Homes, houses... goHERE to get the links to see them all! Stopping by on the parade of homes. Thanks for sharing yours! It is always fun to see projects by aother DIYer! Awesome thanks for sharing! I love Aubrielle's room. I love the quilt! Where did you find that ? You've really added a handful of project to my "need to do" list. You have such great taste!! I love the pillows in your little girls room! The wall also looks fantastic! 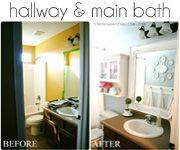 I had seen the wall in your bathroom, but I LOVED seeing the whole thing and the before and after shots!! They did a wonderful job with the ceiling. Who would have thought to do that, but it makes such a big difference! Thanks so much for the tour! Love the bathroom!!! It turned out soooo very cute!!! Wow! So pretty! 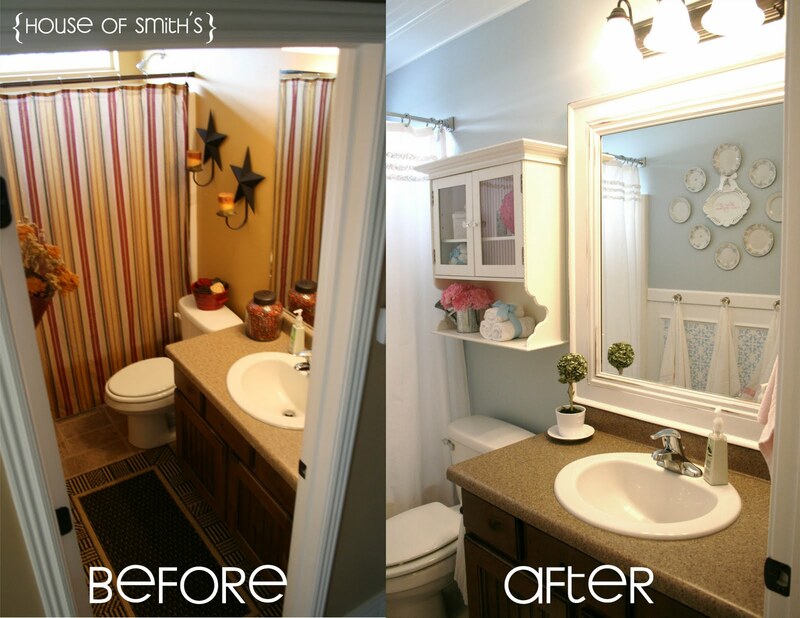 And your bathroom tranformation is amazing. Thanks for sharing! Wow! Love your house and the ceiling in your bathroom!!!! How fun is that! Please move to logan and remodel and decorate my house for me. Thanks! Love that bathroom ceiling and your laundry room is gorgeous! It's gorgeous & I love the ceiling in the bathroom! I'm house #4 and my 4 year old is Aubrie - she's all about ruffles too :) Adorable home & you should be so proud! so great, everything you guys do is beautiful, I think you need to do a tv show and take your show on the road, like I said before you're welcome to start at my house! And I am loving the ceiling, can't wait to see the tutorial. What a beautiful home you have! What a lucky girl to have a hard working husband - they're the best aren't they? The bathroom is AMAZ.ING!!!! I love the side by side picture to see the difference! what a cute home. 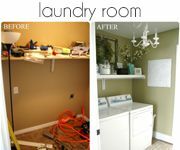 Gosh everyones laundry rooms are so cute , i am going to have to spiff up mine.. well wash all the clothes first..ugh! LOVE everything you do! Seriously so pretty, where I have been looking for a large glass container for my laundry soap, where did you get such big ones in your laundry room? Hey I hope you don't care if someday I copy all of your house! :) haha I really do love it. I can't get over the cuteness of the bathroom ceiling. And did you make the bench in Aubriele's room? I've been looking for one just like that for Sadie and the closest I've found so far is $99 at Ikea so if you have a good place to find on let me know. SHUT UP! You did not bead board your ceiling! I'm in love...LOVE I tell you...I am so going to have to do that...My husband might have to call Cason for some sympathy! We just put our house up for sale...so maybe if I give him just a little time...he'll forgive me! Aubrielle's room turned out so soft and feminine...funny now to see the befores! Love your house Shelley! You are amazing! I'm not sure how I had never read that tutorial before, but it couldn't have been realized at a BETTER TIME!!! New stuff pops out at me every time I read! Thanks!!! Wow your house is adorable! Love the bathroom ceiling we are thinking of doing something like that in our bedroom! oh girl! Everything looks fantastic! I am loving that bench. I ADORE it! Your bathrooms looks fab-come to my house and do mine now-k? I love your blog. I love your style and all your projects. And I really enjoyed your post about the negative comment. It's about time someone did more about it than just mention it. Your projects are always so inspiring. I'm trying to paint a kids entertainment center and I loved the color of your tin in your laundry room. Did you buy it with that blue aqua color or did u paint it? Just wondering if you have a specific color because it's perfect. I love you blog. It's so inspiring and your style is so clean and fresh. I loved your post on the negative comment. So hilarious and necessary! 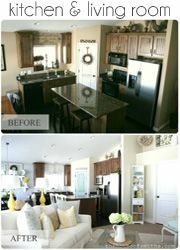 Super in love with your home and style! Love these ideas, great blog! Ok Shelly... you are official on my " Not sure we can be friends anymore" list. What on earth did you have to be afraid of girl! "Not worthy! Not Worthy!" Still love you and your house! I love the vinyl in the boxes in the bathroom! Favorite!!! Hugs! So beautiful! Thanks for letting us in to your home and sharing all your great ideas! Wow! Look at you girl. You are like famous. I am sure Jaman and I will be seeing you on HGTV soon. And I will be so lucky to know you and be able to call you my friend. You do fabulous work! Now go get studying religion, and get a job for spending all that money! Thrift stores aren't cheap you know. :) People are ridiculous. They really need to worry about their own life. Love ya! Hope all is well. I about called you when I was making Bridger his canvas blocks. I didn't have yellow or green vinyl and didn't really want to order two whole rolls for this little project. So lets just say I did a ghetto move and I painted the vinyl. Yep that is right I painted the vinyl and it still turned out cute. Ha Ha! i have seen you on studio 5 and i think you are adorable and always look so darn happy! GoRgEoUs!!!! Love it all, you are so talented!!! All, beautiful, but the bathroom ceiling is my fav! I linked to your house (of all houses on the tour) because of how beautiful it is and because you link to the tutorials in your post. You are getting a few hits off of it! Thanks for blogging! My first visit to your site! I love your home!! Gorgeous! I saw you first on Studio 5 and have checked your blog a number of times. I love your style!! Pretty much want to copy everything you do. Thanks for sharing with us!! it's all beautiful! And I instantly noticed the ceiling in the bathroom! GORGEOUS!!! I have seen your blog at Life With Lil Ones as well as Decorating Addiction. I am catching up with blogs I've been wanting to read and all I can say is no wonder everyone is so wowed by you! Your home is amazing. Fantastic rooms. Thank you for sharing. I will be returning. Wow, every SINGLE detail is beautiful! I love your sense of style. The Towel Hangers - oh so clever and So Stinkin' CUTE! Love your home! I would love to see more of it. My ironing board is tucked into the same place as yours, but looks sloppier without the darling holder. So I'm going to copy your great idea. I hope you don't mind. Love, Love, Love your decorating!!!!!!!!!!!!!! Would love to know where you found rug in laundry room? Just discovered your sight and I'm in love. Thank you! Your home is beautiful. Can i ask you where you found the bathroom cabinent. I am looking for that same look?